I am so thankful November is just around the corner! I am ready to wear boots, scarves and have my fireplace going 24/7. I am also so thankful because all of my hard work going over routines and procedures has paid off with my kinders. My kiddos and I can really get down to work and have a lot of fun from here on out. Their academic progress is absolutely incredible to watch. 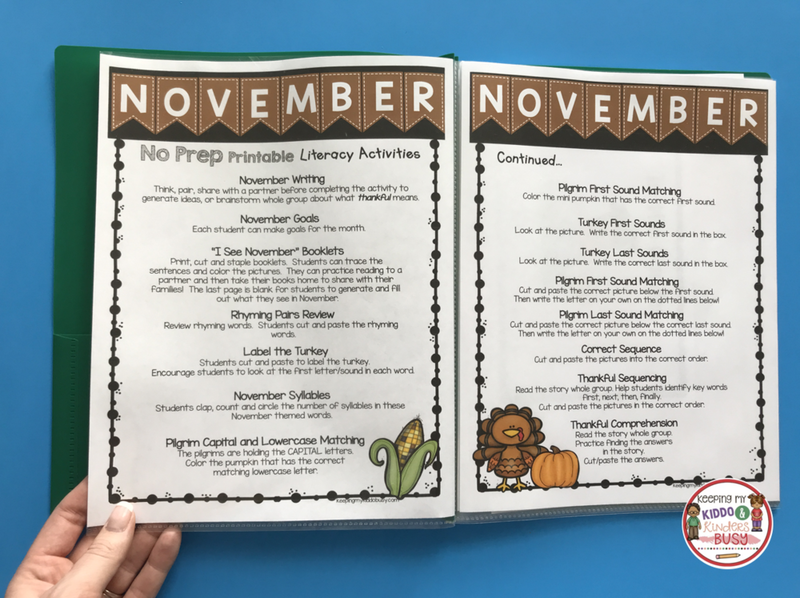 My NO PREP Math and Literacy Pack for November is finally completed and posted! This is my go-to for teaching the Common Core Standards in a fun, hands-on way. I love having these packs on hand each month because they teach the kindergarten standards using fun, engaging activities. I made them to hit the standards we are working on each month – so they are developmentally appropriate and not just “busy work”. I added some FREEBIES to this post so you can try them with your kiddos! I hope you and your students enjoy these activities as much as we do! The activities progressively get harder throughout the school year and are perfect for small groups, whole group, homework and more! I organize each monthly pack in a flexible, 3-pronged folder with page protectors. This way I can easily see the activities and skills and I can pull them to quickly make the copies I need. I put the literacy activities together and then the math activities together. My Monthly No Prep Packs all come with a themed emergent reader. My students love making these each month! This month I am giving this emergent reader away for FREE! I first read it whole group, then they trace the sentences, color the pictures and we split off to read them with partners. Then they get to take them home and read them to their families. They are so proud of their little books! By the middle of the year, they get the routine enough that this becomes an independent literacy center. This time of year we are really solidifying first and last sounds in CVC words, capital and lowercase letters, letter sounds and of course reviewing rhyming and syllables. Each month is the same, and I keep them to make adorable little portfolios that are displayed at our kindergarten graduation. It is so fun to see their progress and they improve SO much throughout the year. There are so many fun, hands-on literacy activities for your kiddos to complete! 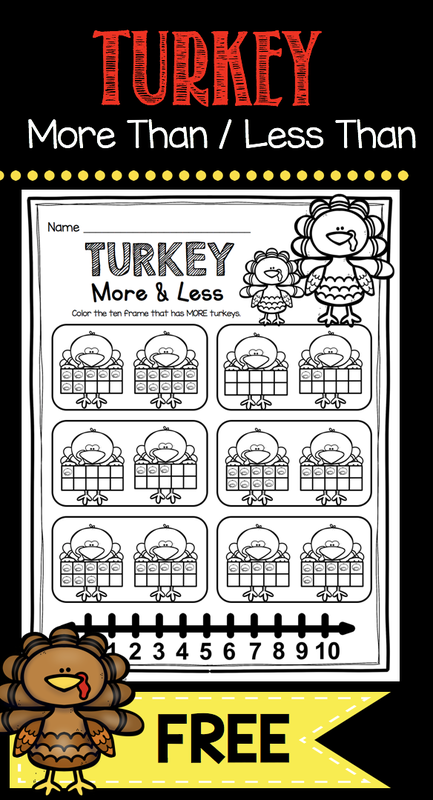 How much fun is this Turkey First Sound activity? It is a freebie! We are tackling sequencing and I teach my students to look for and circle the words first, next, then and finally. We do this and the comprehension activity whole group, and my students really enjoy it! I don't have them write the answer yet, rather it is a cut and paste activity. We are always working on sight words too! This is a fun color by sight word activity. I teach 1-2 sight words a week, or six per month. I use these three tools: trace, color and build worksheets, fluency passages and sight word sentences. In the month of October, we tackle the sight words very, his, be, so, had, it using the worksheets and activities shown above. They do 3 activities with each word to help them see it in different contexts. I start with the trace, spell, color and build worksheet and then go to the sentence building activity and finally practice fluency. My kiddos love the routine of these worksheets, and I have them trained after about a month. By the end of the year, they have mastered at least 50 sight words. Page protectors keep your black lines from getting wrinkled and I love being able to quickly see and pull the activities I need to make copies. I really make sure my students have a firm grasp on counting to 10 as well as writing numbers to 10 by the end of November. We begin tackling numbers 11-20 in the winter, so I make sure they have a firm grasp on 1:1 correspondence as well. These worksheets are GREAT practice!I expose my kiddos to number lines and ten frames early on in the year. I find these are both great tools to use to teach number sense, 1:1 correspondence, subitizing, addition and subtraction and so much more! 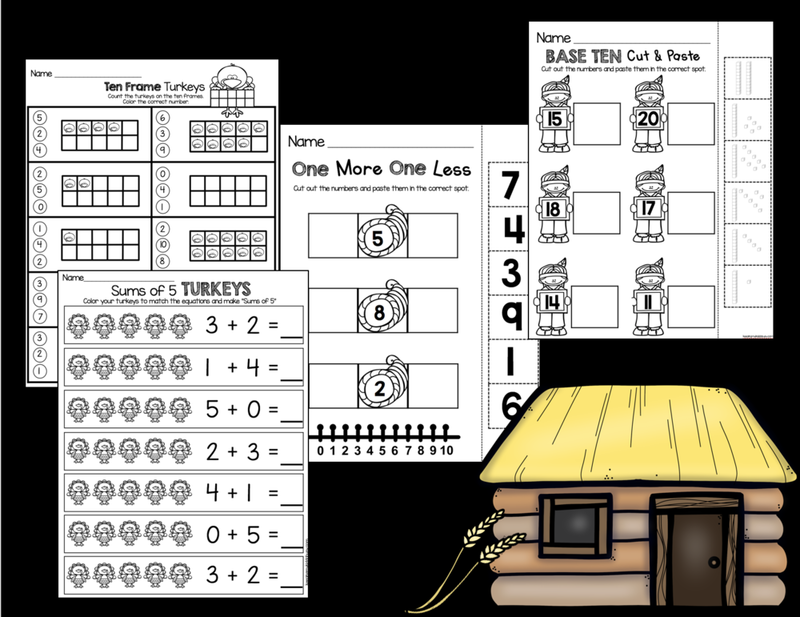 There are addition and subtraction practice pages, along with 2D and 3D geometry activities. Counting on is tricky for some of my students, so we revisit this concept every single month. I haven't started sums of 5 with my entire class yet, but I do use this worksheet for some of my high fast finishers. Are you working on More Than/Less Than with your students? This pack has quite a few worksheets that address this tricky concept. Grab this More Than/Less Than FREEBIE! Ready to get going for the month of November?! I have these packs available for every month! Need homework or morning seat work for your kinder students?